SEATTLE—Shen Yun means the beauty of divine beings dancing. Perhaps this is most evident in the way that the dancers glide across the stage, as if they’re floating. The dancers’ finesse impressed actress, travel writer, and hair and make-up artist Julie Stevens. 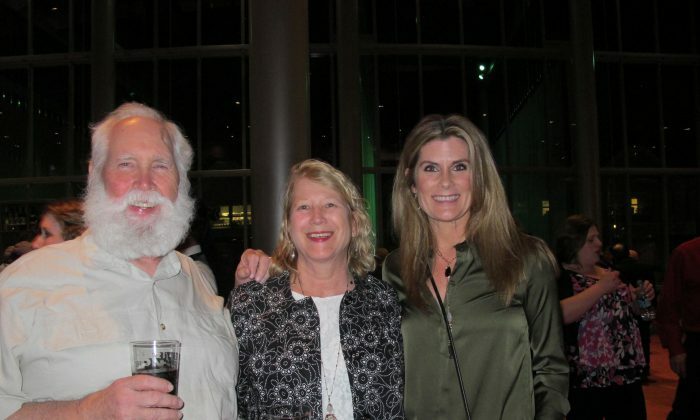 Stevens watched the performance with two friends at Marion Oliver McCaw Hall in Seattle, Washington, on April 5. New York-based Shen Yun Performing Arts is the leading classical Chinese dance company, founded with a goal of restoring authentic Chinese culture through the arts. Its program includes classical Chinese dance vignettes, musical soloists, and stories from ancient China to today told through dance. Stevens, who writes for her own travel blog, was absorbed by the stories depicted on stage by the dancers. “With their timing, so many stories are brought to life through dance. Even though there’s no words spoken, we are absolutely there with them. And you are feeling what they are trying to portray to the audience through their movement and through their dance, their facial expressions. I’m getting every bit of that,” she said. The story of suppression of faith in today’s China shocked Stevens, as she did not know this was happening. “I’m very pleased that they are able to show that to us here,” Stevens said. She was referring to the persecution of practitioners of spiritual practice Falun Gong in China. The discipline, which teaches three principles of truthfulness, compassion, and tolerance, was banned by the Chinese communist regime two decades ago after it surged in popularity in the 1990s with more than 70 million people practicing by the end of the decade. In the resulting crackdown, adherents of the practice have been subject to imprisonment, harassment, torture, and even death. Many of the performers themselves practice Falun Gong, and Stevens was able to sense a higher message being transmitted through their physical movements. “I can definitely feel that they are trying to portray their beliefs and the spirituality through the dance and through the message. I’m getting all of that,” she said. As to the message, Stevens thought it was one of acceptance. “We are all living here in the same Earth, we are all more alike than we are different,” she said. Finally, Stevens gave full support to Shen Yun’s mission to bring back China’s traditional culture. “I think that’s so important to keep that basis; especially you’ve moved to a different country and now you are trying to adopt other culture and other ways of living, you still want to keep where you came from and those teachings, it’s very important,” Stevens said.